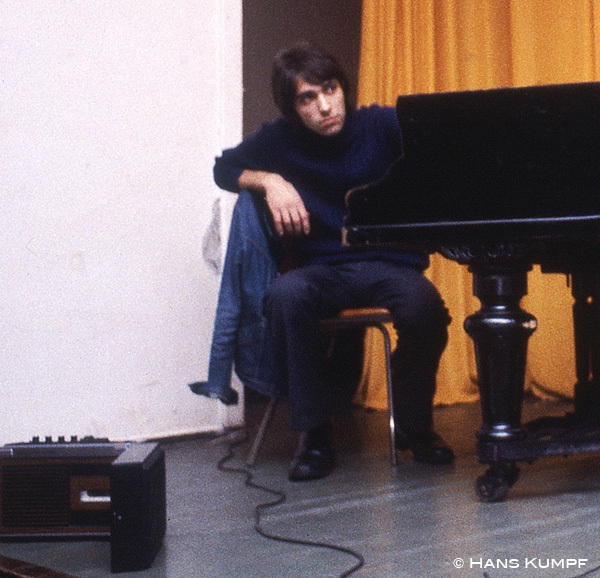 Hans Kumpf: My Trips to Russia 1980 - 1984 • page 2 • "Jam Session Leningrad"
During my first visit to the Soviet Union I had a warm invitation from my Leningrad friends in the Contemporary Music Club to pay them another visit in the near future. 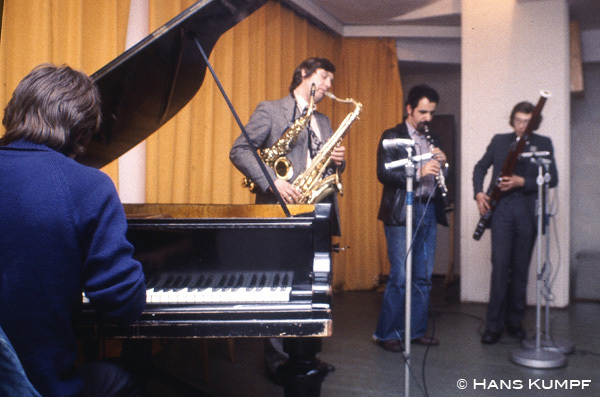 What I actually wanted to do was to take my own group, AK-Musick, which was founded in 1971 and improvises free music. 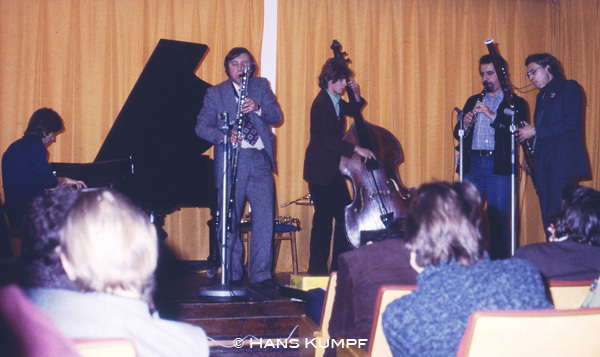 The group appeared at the German Jazz Festival in Frankfurt-am-Main in 1972 and five years later at the Ludwigsburg Jazz Festival, featuring the pianist John Fischer. In the end, however, I was the only one to keep my promise and go to Russia, at the end of 1980 and the beginning of 1981. Good-quality tapes are in short supply in the Soviet Union and I therefore arrived well provided. 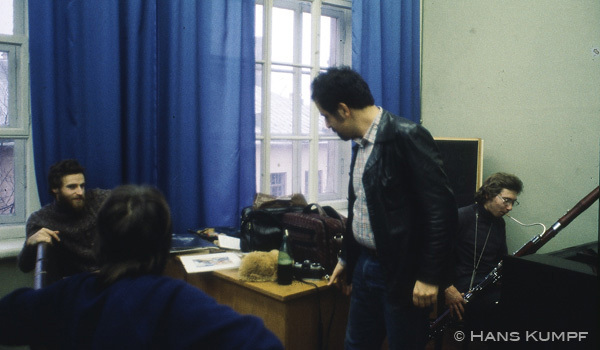 My Leningrad friends were able to organize a 'private' recording. The players were Anatoly Vapirov, Sergey Kuryokhin and Alexander Alexandrov. The music clicked in spite of the language difficulties (the Russian jazz musicians could barely speak English) because of the common code of music. In the performance of the pieces nothing definite was prearranged except for the instrumentation and a vague outline of what was to be played. On that occasion everything was very intellectually orientated, but next day's concert in the Lensoveta Hall was marked by more emotional moments and 'happenings' . 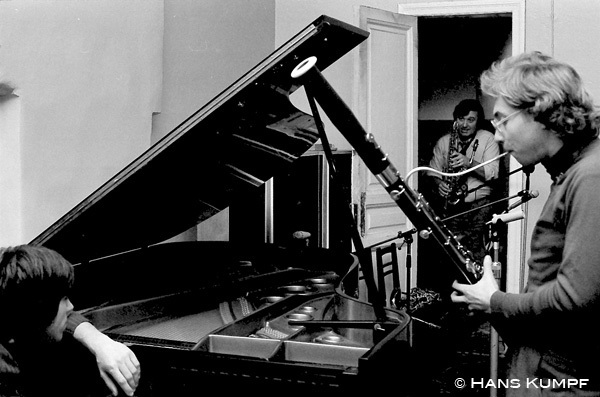 Only the inner circle of avant-garde jazz enthusiasts had been invited and there was a certain air of secrecy about the whole thing. Once again there were no difficulties over musical understanding. Of the Russian players I was most impressed by the bass player Vladimir Volkov, with whom I played a delightful and subtle duet. I was also fascinated by the attentiveness and warmth of the audience.